In a few months, this will be my veggie patch. Sitting by the fire, nursing my aching back, legs and shoulders. Watching the endless coverage of what the TV is calling “The Blizzard of 2013”. I guess they couldn’t get themselves to talk about “Nemo” without giggling. Here’s what I think of this winter wonderland. Now that I know that my kids are safe and that all three have power, I’m ready for a nap! I couldn’t sleep last night, because I felt guilty being warm while they were cold! Now that I know that my Mom has power and has been plowed and shoveled out by her wonderful, incredible neighbors, I am ready for a good long nap. After I fretted about my kids at midnight, I fretted about Mom at 2AM! Now that I know that my brothers and sisters and their spouses and kids have power and heat and light, I am ready for a nap. You can guess who I was worried about from 3-4 AM……. Having a big soft couch right next to the roaring wood stove is the BEST. Maybe I’ll nap here. Right after my nap, I intend to get in there and soak. Maybe with a glass of wine in hand. 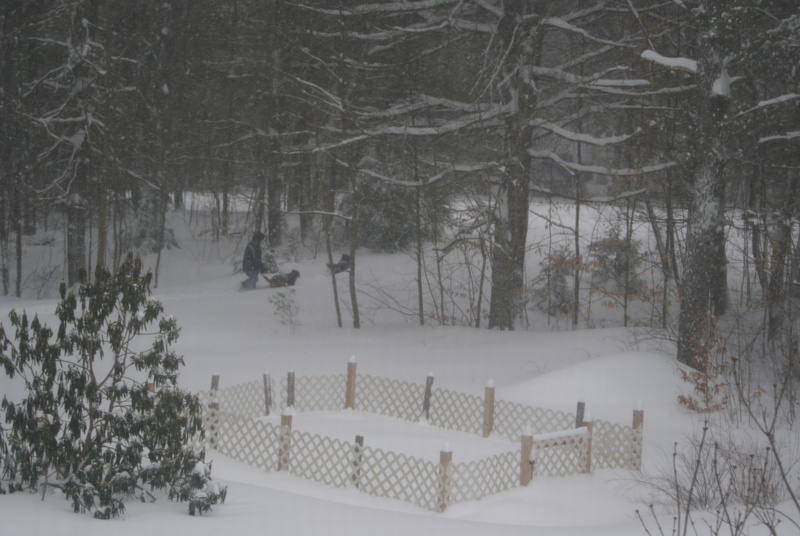 Its a good thing I baked that incredible chocolate cake yesterday; I need the sugar boost to finish the shoveling! And you know what else I think? I liked “hunker day” better than “shovel day”. It will be OK with me if we don’t see the front walk until June. I’m perfectly happy to use the garage door as my main entrance! And finally, I really love my dogs. They constantly remind me that there is joy to be found in every situation. Be warm, be safe, and happy hunkering to everyone who has experienced the wrath of Nemo! “Hunkering” by the fire right now, thank you for your kind thoughts! 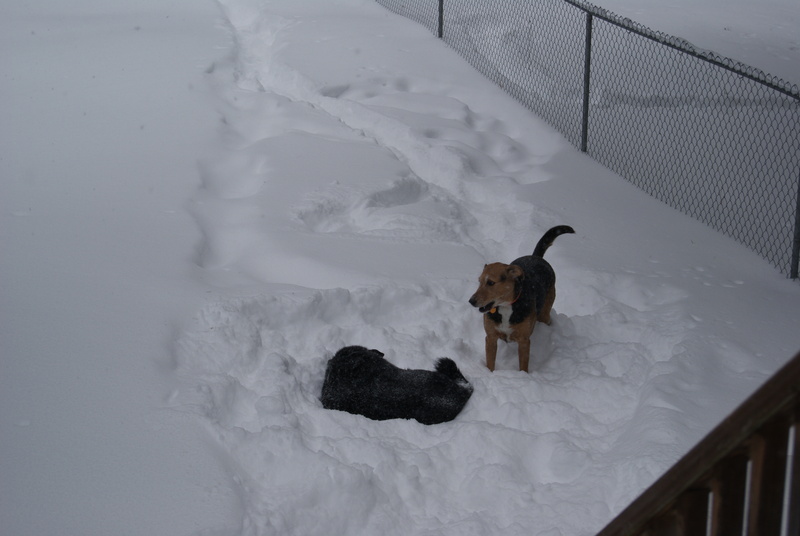 I need to get some dogs so I can also see the happiness in the snow. Yeah, I was stretching it a bit. THEY love it, me not so much! Given the circumstances, the chocolate cake probably counts as medicinal. Ah, good thought! You are a medical genius! I’m glad you and your family are all safe and warm. I would have been up worrying too. I think you definitely have your priorities straight. Happy napping and soaking. I love seeing the dogs romping. Soft couches and wood stoves are a great combination. And I bet your chocolate cakes are exceptional, so I hope you’ll bring one to our lobster dinner in NH. I will bring a cake when we meet! This is my very first successful cake; I am a good cook but have been a crappy dessert baker. This recipe rocks, though, so even I was able to manage it. Just remember when you get back here, you need a wood stove, a hot tub, and some doggies for survival. 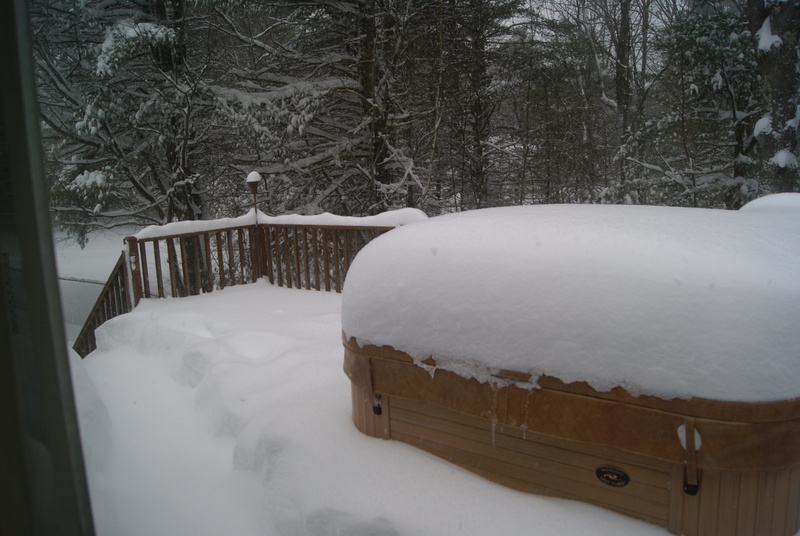 Takes me back to all the snow we received in 2010….and I was stuck shoveling snow and shoveling snow and shoveling snow while NPR put my husband up in a hotel. He was taking photos of the pool and I was trying not to be irritated. Thinking of all of you in New England right now! Oh, my goodness, I would have made my husband pay me back for years!!! We are kind of having fun with this all at this point; so much snow, but everyone is safe and warm. It has been years since we’ve seen anything like this! We seem to have just about 30 inches of snow on the ground. Driveway still not plowed, so I am glad we stocked up. Your priorities are absolutely perfect. I wish I could sit in a hot tub with a glass of wine too! Great photos and WOW. That’s a lot of snow. I think you’re handling it very well, too. Bravo. Enjoy the quiet of a snowy day. It really is a lot of snow! Yikes. Haven’t seen one like this in quite a few years. Today we off to snowshoe at a local lake. Exciting stuff! How fun! I sort of wish we had enough snow here in the valley to do some snowshoeing. Note to self: When we move back East, find a place to live with a hot tub – and a coat for our pit bull, Sylvie! Absolutely! Both are essential! Although my dogs don’t wear coats, they do snuggle down by the wood stove on a regular basis!